Dramatization of real people is a tricky thing, even when done in the most speculative fashion. Shakespeare most often got away with it by creating plays based on history books, not recent memory, much less directly based on the living. The closest he got was late in his career, in the John Fletcher collaboration of Henry VIII. While that particular play is uneven, in production, its most powerful moments often come by seizing onto the characters’ iconography—utilizing just the right stance or the right costume as depicted in the most familiar portraiture. In David Muse’s production of Mike Bartlett’s King Charles III, which opened this week at the Shakespeare Theatre Company, the iconography of one of the most famous families in the world today is drawn upon. The play opens in a somber requiem, sung by the ensemble in the final moments of the (unseen) Queen Elizabeth II’s funeral. The music builds until the ensemble fades back to reveal the Windsors and—despite a cast with an uneven actual resemblance to that family—the audience en masse shares a moment of instantaneous recognition (due in no small part to costume designer Jennifer Moeller’s work). That iconography has worked its magic and we see before us Charles and Camilla, William, Kate and Harry. A risky concept has turned the audience into believers for a night. It’s a hell of a moment of theatre, and the evening has only just begun. Theatre production of "King Charles III, directed by David Muse. Photo by Kevin Berne. While it's may seem like a play that premiered in 2014 is a strange fit for a classical theatre, Bartlett’s play works better than I might have supposed. It contains echoes of number of Shakespeare’s plays, from Macbeth and Julius Caesar, to Henry IV and Richard II (indeed, I walked out wondering how exactly the full title of the play wasn’t King Charles III: a modern fantasia on Richard II, with so many parallels on kingship, identity, and hollow crowns throughout the play). Bartlett also utilizes the conceit of a combination of prose and iambic pentameter, which gives audiences the pleasure of heightened language in our own contemporary vernacular, suggesting a form of theatrical translation for the audience experience of Shakespeare's day into our own. Just to underscore that shift, when the common man comes onstage to converse with a prince, it's Rafael Jordan and a kebab cart rather than a farmer or old-fashioned tradesman. The play imagines a near future of Prince Charles’ sudden ascendance to the throne, and the subsequent crisis of political and national identity that besets everyone in short order. Despite its premiere date tracing back three years ago, as most things seem to do nowadays, it carries an unusual resonance in today’s Washington. Even with the action removed to a different country and an imagined future, questions of democratic principles, complicity, and responsible rule carry a special frisson of familiarity for DC audiences. 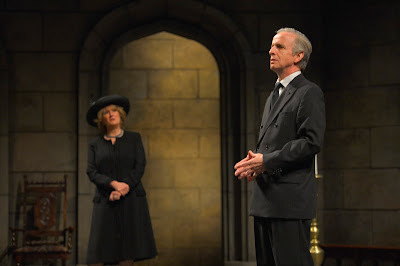 The play centers on a constitutional crisis when the new King Charles III (Robert Joy) refuses to sign a new law from Parliament; Charles sees a compromise of the English free press, and the Prime Minister (Ian Merrill Peakes) sees a figurehead standing in the way of the will of the people and their elected representatives. All sides act from their genuinely held principles, but Bartlett is most concerned with how Charles reacts as a new monarch, finally stepping out of the wings and into a role that isn’t quite what he imagined. The cast, led by Joy, does excellent work. Joy is a compelling tragic figure, even in Charles’ weakness. His habitual need to soliloquize to the audience skillfully balances a desperation to be understood with a dangerously stubborn self-centeredness. Jean Paulson is a sympathetic Camilla, the only one to support Charles unequivocally, while Allison Jean White’s Kate has both sympathy and an underlying steel that shores up Christopher McLinden’s William. Bartlett gives us a pair of young lovers in Michelle Beck’s Jessica and Harry Smith’s Prince Harry; while it’s a pleasure to see Beck back at STC after an excellent Ophelia in Michael Kahn’s most-recent Hamlet, she seems to struggle with an accent while Smith has a propensity towards bellowing. The set design by Daniel Ostling allows one Gothic chamber to represent all corners of palace and Parliament that are required by the script, and lighting designer Lap Chi Chu does exceptionally beautiful work shading its corners and the statues of three kings that loom over the proceedings. King Charles III at STC manages the difficult trick of being both entertaining and thought-provoking, sometimes in unexpected ways. Bartlett’s script takes a few turns that are questionable, and I found just as much pleasure in debating those after the final curtain as I did in enjoying the intended narrative that was performed onstage. We all have fallen prey to the old curse and live in interesting times, whether we like it or not, and King Charles III ably challenges us to see its characters’ struggles, and thereby ourselves, out in the light.